From the nice day, run on Lady Bird Lake department... 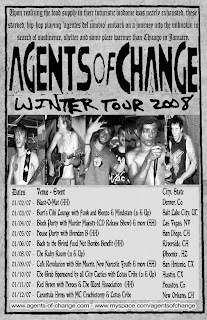 Agents of Change, The Word Association and Heroes @ Red 7 on Jan 10th. So I haven't gone to the grocery store since I've been back from vacation and I'm runnin' really low on things to eat. After going running on Town Lake, I decided to eat a pack of Ramen noodles and boil some eggs I had left over. After the eggs were boiled, I cracked them and man did they smell. Unwisely, I decided to go ahead and put them in my Ramen noodles. I've been sitting around for the last hour wondering how my stomach's going to react before I head off to HEB. I hope this story ends well. Otherwise, my next blog post will be from the toilet. All the music and politics aside, AOC is basically a bunch of kids who grew up inside the box and needed a way to exorcise their demons. It doesn't get fancier than that. Well actually, I take that back, it gets a lot fancier than that. We want you to think and be an active participant in your world. Whatever that may mean for each individual; we humans, the dynamic, vivacious creatures that we are, must resist the growing complacency that is enveloping every aspect of our existance. You gotta dance. You gotta smile. You gotta laugh, love and live. While doing all this you must be a conscious decision maker. Every action you make has a ripple effect, and what may seem like an insignifigant choice to one, may have grave consequences for another. For example,I assume you are wearing clothes right now, where are they from? what country, what company? Do they care about their workers? Do they treat them right? Pay decently? You deciding to buy a shirt from Nike might directly result in the oppression of a foreign worker. Not to sound preachy, but we as a race can do better. So with that mindset, we create a hip-hop sound that's like none other. A smattering of different styles and influences; far too many to enumerate. I suppose I should just let the music speak for itself though.